Many individuals purchase personal computers (PC) with very little PC or technology knowledge. Computer Troubleshooters can help you from the start by assessing your computer needs based on the use you expect to make of it. We can then purchase the required PC and set it up according to your needs, connect your PC with wireless internet and synchronise other wireless devices such as a printer, mobile phone or even your TV if it is compatible. We can also give you some basic training and advice on whatever computer or technology trouble you are having. We can help you select software based on what you are trying to accomplish, then we can install it for you and get you up and running. CTS Team also offers computer repair and trouble-shooting, tune-up, virus cleanup, data recovery, data backup and software trouble-shooting services. We can help where computers or wireless networks are experiencing reoccurring computer problems – computer freezing, computer crashes, slow computer startup, continual requirement to reboot or computers and /or Microsoft Windows simply does not start anymore. 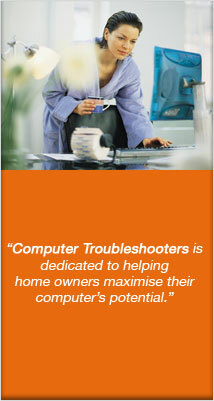 Computer Troubleshooters has been providing support for home users for over 14 years across Australia through our network of 90+ locations. We provide on site home computer repair solutions as a great alternative to the computer user who doesn’t feel like dragging his or her heavy computer to a computer repair store. Computer Troubleshooters can come and visit you, to save you the hassle of having to unplug everything and load it all into the car. We understand how busy life can be, so we’re happy to arrange a visit at a time that suits you. Sometimes your home computer repair needs become more serious than we both initially imaged. If we can tell that the problem will take a bit longer to resolve (e.g. maybe requiring a scan or diagnostic which is best left running overnight). You don’t want to be paying us to watch scans run, so we may recommend that we take your computer back to our workshop. This also gives you additional benefits like the usage of our internet connection (not your monthly allowance) for any software update or / and downloads. Rest assured that we will work to your budget and will keep you informed every step of the way. Your computer will then be returned to your home, and critical functions like your internet connection, emails and printing will be tested before we leave. You’ll even receive a follow-up call within a few days to confirm that your computer didn’t start playing up again the moment we walked out of the door! Home computer repair is one of those tasks that you’ll thank us for later. For school assignments, paying the bills, sharing photos and staying in touch with family and friends all over the world – a computer at home offers amazing benefits for communicating, researching and handling the paperwork of life! The impact of home computer repair solutions can be felt quickly by the whole family if your computer runs slowly, freezes up or even refuses to start. You want to call someone that you can trust, to get everything working again as it should.